Horse Racing isn’t just for the Brits! As many of you probably know, in late 2013 I moved from California to Kentucky. BIG change! We absolutely love Kentucky, and as a born and bred Southern girl (Mississippi), I feel as if I have come home. No offense to California! LOL! Yet despite my ancestry, living on the west coast since a very small toddler overwhelmed my genetics, so adjusting to and comprehending all the aspects of Southern life have taken a while. I doubt I’ll ever completely shake off the Valley Girl demeanor or master a drawl that can compete with my father, but little by little I am fitting in. One important step is grasping onto the extreme, nay VITAL importance of Derby. You see, to folks in Kentucky, this time of year everything revolves around the Kentucky Derby. In fact it is so entrenched into the culture and genetic code that all one has to say is “Derby” to instantly comprehend the entire meaning! Thanks to my two dear friends Stephanie and Juliet, I was educated last year. Then, of course being me, I did more research! I wrote a series of posts on my website last year, and have decided to share some of the history here on Austen Authors. Racing of horses in the US dates to 1665 in New York. In 1798 English thoroughbred racing legend Diomed was imported to Virginia. Having failed as a stud in England, and with his best days thought to be behind him, the 21-year-old stallion adapted happily to American life, siring so many children that he is considered the father of American Thoroughbreds. Throughout the early to mid-1800s westward-moving settlers establish the sport in Illinois, Missouri, Texas, Louisiana, and even California. Thoroughbreds, as well as other breeds of horses, raced for entertainment all across the expanding country. Alas, racing as a sport suffered during the Civil War when thoroughbred breeding centers were destroyed and horses are pushed into military service. After the war, racing enthusiasts revived the sport, and for the first time in its nearly 200 year history did so in an organized, nationwide manner akin to the English standards. A big help was the introduction of the American Stud Book in 1868, which became the official breed registry for American Thoroughbreds. Fine race tracks were built, local Jockey Clubs were established, and rules of the sport were laid. However, corruption was prevalent at many racetracks, in large part because there was no official, national governing body. This was addressed in 1894, when leading figures within the sport formed the American Jockey Club, the organization based on the British Jockey Club. On June 19, 1867 the first annual Belmont Stakes was run at Jerome Park, New York. (In 1890 organizers moved the race to Morris Park, then in 1906 to Belmont Park.) On October 25, 1870 the Maryland Jockey Club staged its inaugural meeting at Pimlico Racecourse, just outside of Baltimore, and two-days later ran its first race. The winner was a huge colt named Preakness, of whom the track is now named to honor. In 1872 Colonel Meriwether Lewis Clark, Jr. – grandson of William Clark of the Lewis and Clark expedition, and grand-nephew of George Rogers Clark who founded Louisville – traveled to England to attend the Derby Stakes, the most prestigious and richest race ran annually since 1780 at Epsom Downs in Surrey. Upon returning home to Kentucky, Clark organized the Louisville Jockey Club, modeling England’s Jockey Club, for the purpose of raising money to build quality racing facilities just outside of the city. The track was named Churchill Downs for John and Henry Churchill who provided the land for the racetrack. The first Kentucky Derby horserace was held at Churchill Downs on May 17 in 1875, and a race has run every year without fail. Churchill Downs was built in 1875. A few upgrades were added, most notably the twin spire grandstand in 1895, and refurbishing has been done, but for the most part the track and building are unchanged. In 1986 it was declared a National Historic Landmark. The seating capacity is 120,000, and on Derby day up to 150,000 people fill the stands to literally standing-room only! In addition to the track, grandstand, and stables, the Kentucky Derby Museum is also housed on site. It contains two-stories of exhibits, traces every horse who has ever won the Derby, has a 360 degree theater, and is the burial site of six past Derby winners. Throughout the year, in three separate “meets” there are many races run at Churchill Downs. 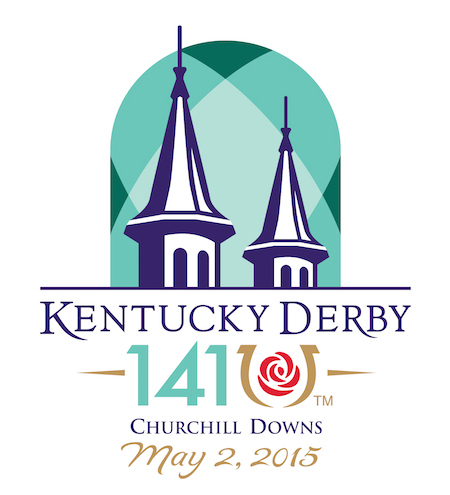 Each year is kicked off with the spring meet beginning one week before the Derby in May, and that lasts through July. A second meet is in the fall from October through the Thanksgiving weekend. In 2013 a third meet was added in the month of September. In 1919 Sir Barton became the first horse to win all three races. At this point it was a WOW moment, but it is important to note that the three races were, and still are, independently controlled franchises. In 1930, when Gallant Fox became the second horse to win all three races, sportswriter Charles Hatton whimsically created the phrase “Triple Crown”. Two years later the desire to lay claim to the term “Triple Crown” was so great that the three races were set to occur on specific days in spring so as to never overlap. The Derby was set for the first Saturday in May, launching the three-race cycle. Yet, as I noted before, each race is independent. Owners who wish to enter their thoroughbred into all three races may do so, of course, but it is not required. Last year the sour-grapes owner of California Chrome threw an unseemly hissy-fit when Tonalist won the Belmont Stakes (Tonalist did not run in the prior races) which in his opinion “robbed” California Chrome of the Triple Crown. The result was lots of online chatter and blogs on the subject of the “fairness” in a horse tired from two grueling races being pitted against a fresh horse. Thankfully most people were sensible enough to comprehend the traditions and rules of the game! Winning the Triple Crown was never the intention of the three top races, and even once established as an allowable possibility, it is a rarity. Only 11 horses have managed the task, the first in 1919 and the last in 1978. Winning the Triple Crown is special because it is difficult and because it can only be done by an extraordinary thoroughbred. The Kentucky Derby is a Grade I stakes race (pertains to the high level requirements and purse size) for three-year-old thoroughbred colts and geldings. Fillies can run in the race, but they have to work much harder to compete with the male horses. The winner receives a 14-carat gold trophy, a garland of 564 red roses sewn into a satin blanket, and an estimated $1.24 million purse. A total of $400,000 will be awarded to the runner-up, $200,000 to third, $100,000 to fourth and $60,000 to fifth. 1. Equines must be proven to be a direct descendant of three stallions – Darley Arabian, Godolphin Arabian, or Byerly Turk – from the General Stud Book of England, bred back in the late 17th and early 18th centuries. 2. All horses must be 3-year-old thoroughbreds leveled at grade 1, at the top of their form with sufficient group 1 winnings in past performances to ensure they are fit for the race’s level. 3. Weight allocation: 126 lb (57.2 kg) for colts and geldings and 121 lb (54.9 kg) for fillies. 4. Fees to enter the Derby include a $600 – $6000 nomination fee (depending on the date of application), and another $50,000 total before race day. 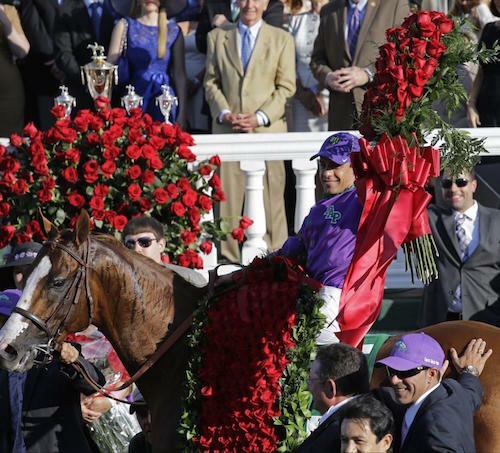 California Chrome, winner of the 2014 Kentucky Derby, and jockey Victor Espinoza. 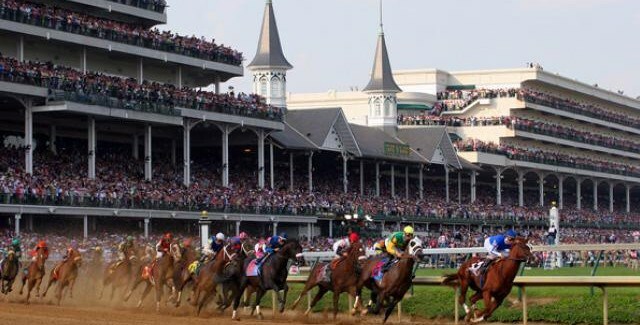 The Derby race is 1 ¼ miles (2 km) long, and is known as the “most exciting two minutes in sports.” Only two horses in history – Secretariat in 1973 and Northern Dancer in 1964 – have come in under two minutes. The Derby is frequently referred to as “The Run for the Roses” because of that lush blanket of 564 red roses awarded to the winner. In 1883 New York socialite E. Berry Wall presented roses to ladies at a post-Derby party that was attended by Colonel Meriwether Lewis Clark. This gesture gave Clark the idea of making the race’s official flower a rose. In 1896 was the first recorded account of roses being draped on the Derby winner. By tradition, the Governor of Kentucky awards the garland and the trophy. Believe it or not, I have only scratched the surface on horse racing history and the Kentucky Derby in particular. Nor did I mention The Oaks or touch on the multiple traditions and elaborate events that surround Derby season. It is intense, trust me! I’ll be sharing more on my blog over these next two weeks leading up to the Derby on May 2, so pop over from time to time. Today I have a companion post discussing the opening ceremonies of the Kentucky Derby Festival. 15 Responses to Horse Racing isn’t just for the Brits! I am not into horses or horse racing at all. But this was interesting, especially the rules about who can enter. My husband went a few times as he had clients from the area near Churchill Downs. The closest for me were the T-shirts he brought home for the kids and me. I have noticed the races in the newspaper and follow if there is any chance of a horse winning the “Triple Crown”. Thanks for sharing this enlightening post, Sharon. I love horseback riding but have never tried to ride one by myself. It’s my bucket list. I always enjoyed watching the Derby when I was growing up. There are so few horse “events” shown on television that a horse-crazy girl could watch that it was necessary to my happiness to watch it. I remember watching Affirmed beat Alydar for the Triple Crown in 1978. Now that was exciting! I had been in Lexington Kentucky 30 years ago on Derby weekend with the equestrian team from our college. Our intercollegiate nationals were being held at Kentucky Horse Park that weekend. I was intrigued by all the fuss the hotel went through for the Derby. I understood a little about the history of the event, but now understand a great deal more thanks to the informative post. The direct lineage of thoroughbreds reminds me of the direct lineage needed for the nobility and by extension the monarchy. We always watch the Kentucky Derby and pick out a horse we can root for and hopefully be the winner. The Triple Crown is so exciting to watch! Wow, I had no idea it was so intense! I live in Virginia where there is still a horse race nearby (this weekend actually). I’ve never been but I envision myself in an Eliza Doolittle moment if I would go. And wouldn’t it be fun to have the fashion too? Fascinating bit of information! I agree with Jenni about the horses having to have come from those 3 horses in England! How odd is that! I thought if they could compete amongst the others, they could enter. Silly me. My understanding (and I am NOT an expert) is that all horse races have strict rules for entry. Whatever the breed. But true, fair competition can only happen if the horses are matched. That is where the challenge comes in, and, of course, the betting stakes! Also, owners enter their horses into races (paying to do so), but they are not all guaranteed the opportunity to race. Especially in the big races, like Derby. Only 20 horses race each year at Derby. Many may enter, and many may actually qualify, but not all will be accepted to compete. They “apply” for the privilege, and the authorities at Churchill Downs and the Jockey Club decide. I haven’t investigated the inner workings, and imagine there are very detailed guidelines. Then again, it may come down to picking based on gut feelings or other arbitrary reasons! I have always thought I would love to be a part of the hoopla simply to buy a fabulous hat. LOL Incredible history. The hats, and clothing in general, are awesome at Derby. I’ll be posting a couple blogs on Derby fashion over on my website in the days ahead. Lots of pictures! Holy cow! I had no idea they were so strict in their qualifications to run the race. It’s funny that you HAVE TO be a direct lineage with horses from 17th-18th century. As if only those bloodlines were the fastest or something. It’s kind of silly, isn’t it? Thank you for such an informative post. Fascinating. Yes it is quite a big deal, the breeding. It does seem silly in one respect, but there are so many breeds of horses that the bloodlines must stay pure. And, while I am far from an expert on horses, my understanding is that Arabians (and by extension, Thoroughbreds) ARE the fastest bred. They also have endurance, although not as much as other breeds. That is why Thoroughbred races are short, but very very fast and exciting!